Bursitis of the knee results when any of the three fluid-filled sacs or bursae in the knee joint become inflamed due to injury or strain. The semimembranosus bursa lies behind the knee and may coexist with a Bakers cyst. 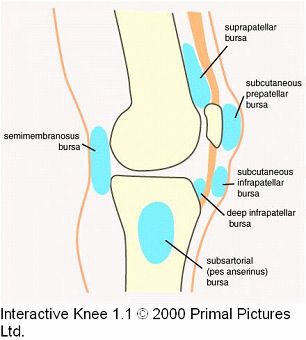 Prepatellar bursitis occurs when the prepatellar bursa becomes inflamed due to direct trauma to the front of the knee. This commonly occurs when maintaining a prolonged kneeling position, and is often referred to as “housemaid’s knee”, “roofer’s knee”, or “carpet layer’s knee.” Symptoms can include swelling, warmth, tenderness and redness. Prepatellar bursitis can cause significant pain when kneeling, and can cause stiffness and pain with walking. Compared with knee joint inflammation (arthritis), it is usually only mildly painful. The knee’s range of motion is usually not impacted by prepatellar bursitis. Prepatellar bursitis can occur when the bursa fills with blood from injury. It can also be seen in rheumatoid arthritis, and can occur from deposits of crystals, as seen in patients with gouty arthritis and pseudogout. The prepatellar bursa can also become infected with bacteria (septic bursitis). When this happens, fever may be present. This type of infection usually occurs from puncture wounds or breaks in the skin. Infrapatellar bursitis occurs when the infrapatellar bursa becomes inflamed. Infrapatellar bursitis is commonly seen with inflammation of the adjacent tendon as a result of a jumping injury, consequently it is referred to as “jumper’s knee.” This condition is generally treated with ice, rest, and oral anti-inflammatory and/or pain medicines. Pes anserine bursitis is inflammation of the anserine bursa and is most common in middle-aged women. Anserine bursitis is particularly common in those who are obese. With this bursitis, pain is most noticeable in the inner knee while climbing or descending stairs. Anserine bursitis is generally treated with ice, rest and oral anti-inflammatory and/or pain medicines, although cortisone injections are also given. Common symptoms of bursitis include pain, swelling, warmth, tenderness and redness. The treatment of any bursitis depends on whether or not it involves infection. Aspetic prepatellar bursitis can be treated with ice compresses, rest and anti-inflammatory and/or pain medications. Occasionally, it requires drainage of the bursa fluid. This procedure, known as aspiration, involves removal of the fluid with a needle and syringe under sterile conditions, and can be performed in the doctor’s office. Noninfectious knee bursitis can also be treated with an injection of cortisone medication into the swollen bursa. If the bursa is septic or infected, it requires even further evaluation and treatment. The bursal fluid can be examined in the laboratory to identify the microbes causing the infection. It requires antibiotic therapy, often intravenously. Repeated aspiration of the bursa fluid may be required. Surgical drainage and removal of the infected bursa sac (bursectomy) may also be necessary. Common treatments for knee bursitis, if the knee bursa is not infected, included ice compresses, rest, anti-inflammatory and pain medications, and therapeutic exercises. Other measures include anesthetic injections with or without corticosteroids. Additionally, the future of platelet-rich plasma (PRP) and stem cell therapy shows remarkable possibilities in advancing future treatment options for conditions that otherwise have limited recourse. With platelet-rich plasma (PRP) therapy, the healing or growth factors in a person’s own blood are captured and injected into the knee. While helping to normalize a healing environment within the knee, platelet-rich plasma may also assist in decreasing recuperative time. By introducing stem cells into the area of the bursea, the growth factors that are released from one’s own stem cells or platelet-rich plasma may facilitate a rapid healing response by normalizing tissue. If you continue to suffer with chronic knee pain caused by bursitis of the knee and your current treatment plan leaves you wanting more options, perhaps a fresh set of experienced eyes can change your outlook. Since 1990, Dennis M. Lox, M.D has applied his personal interests in sports medicine, cutting-edge regenerative medicine and chronic pain management to helping patients increase their quality of life. Contact us for an appointment at 727-462-5582.